With January over and spring on the horizon, I’m already brainstorming all the art projects I can’t wait to venture outside for. This week, however, I’ve been tucked away in my studio, nursing a tea, full of inspiration for one of my favourite occasions to get crafting for: Valentine’s Day! Having given my workspace a premature spring clean, I got down to business working on some cute and colourful designs for the loved ones in my life, this time using my versatile and vibrant Inktense Paint Pan Set and Inktense pencils. 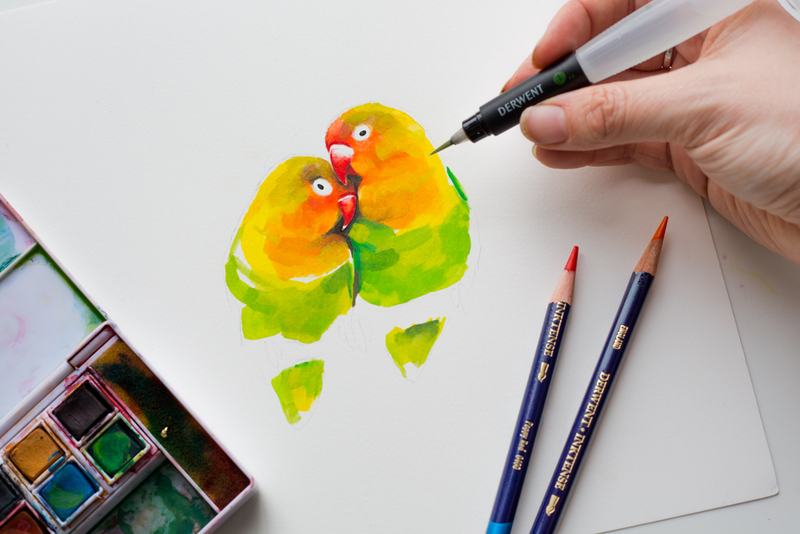 After deciding on the perfect pair of lovebirds as my subject, I chose a smooth watercolour paper to work on. I prefer the smoother papers for illustrative work as I find it best when wanting to maintain a high level of detail, I tend to use textured paper for my more expressive, experimental work. I put down a faint pencil outline with my 0.5 precision pencil, just to give myself a guideline to work with. Using my waterbrush, I then mixed various shades of greens and oranges for my birds. You’ll be amazed at the shades you can create by mixing just a few different colours from the 12-colour pan set. When one layer has dried the colour is fixed and permanent meaning you can apply several over the top without it reacting to the ink you’ve already laid down. 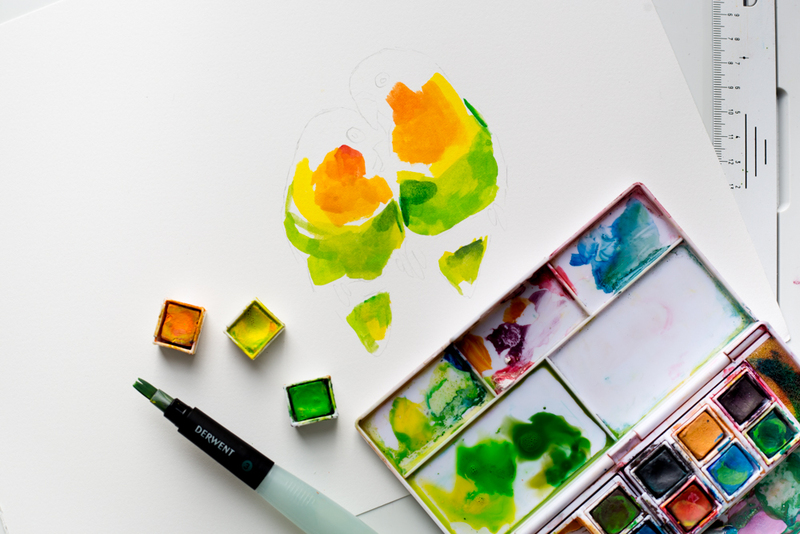 This also makes Inktense great for working on fabric, so if you really fancy making a grand gesture this Valentine’s Day, why not be brave and give a really personalised gift. I know I have a few ideas brewing for a pair of shoes I’ve been holding onto for just an occasion. My next step was to bring in my Inktense pencils to add a little detail and shadow. This would have worked with the pan set too, however, I enjoy the control the pencils give. By keeping the tips to a sharp point it’s easy to add detail and definition. I wanted to keep this piece fairly loose so I left the bottoms of the birds as they were, despite temptation to keep adding I was happy with the marks I’d already created and have learnt that sometimes less is more. Once I was happy with my lovebirds, I couldn’t resist adding a little gold foil and,, of course some wording on there to finish my card off. To create the lettering, I once again picked up my water brush. The water brushes come in sets with various flexible tips and with the water contained in the barrel of the brush, there’s no need to keep dipping the brush and disrupting the flow whilst you are lettering, the water flow is easy to control with a gentle squeeze of the barrel. 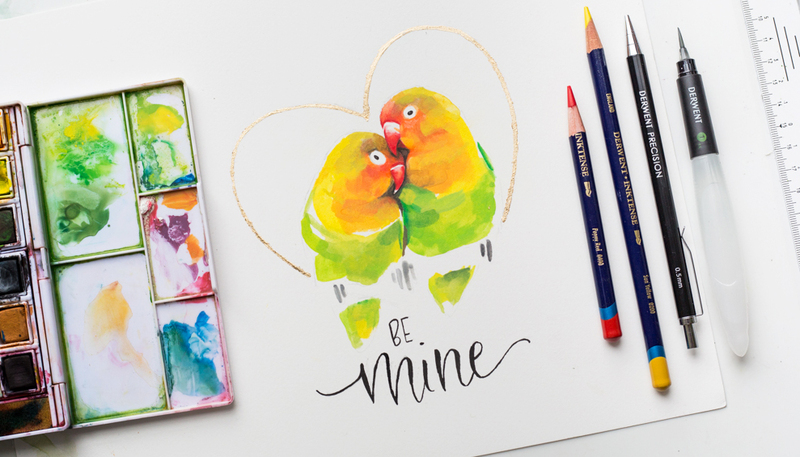 Finally, I added some feet to my little lovebirds with my Inktense pencils and here I had my first Valentine’s card. I hope you all feel the love this Valentine’s day and manage to find time to dig out the art supplies and show them a little love. I look forward to seeing my social media feeds flooded with beautiful valentines’ artwork this year, if I’m really lucky I may even receive a card myself! When will individual pans for Inktense travel set be available? The sets are marvelous, but I can’t keep buying sets because one pan of a much-used pan has run out. They do take a bit of getting used to, the water-brush is a great idea for painting out of the studio, but you still need wash brushes or sponges to create washes for skies or expanses of water, etc. To obtain highlights I purchased an Inktense antique-white pencil, which does the job when it’s dry. Love the set for fine work though. This is a great idea and the project is beautiful. Thanks. This is so lovely! How did you add the gold foil?